Stores that are replete with goods to sell are well-stocked and completely supplied to satisfy many customers. After eating a dozen doughnuts at the bakery, Doughnut Don’s appetite for sugar was satiated or completely satisfied. These sugar needs happened from time to time, but Doughnut Don could always count on “Bart’s Bakery” on the corner to fully fill or satiate his large sweet tooth. In fact, after some visits to Bart’s, Doughnut Don consumed so many doughnuts that he often felt too full, stuffed, or satiated by sugary delights. Quiz: Try again! When is one satiated? When one has sudden desires for certain types of food. When an appetite has been completely, or sometimes excessively, filled. When one is very greedy. Say She Ate My foodie friend would not stop talking or thinking about food. She would constantly say she ate this, and say she ate that, as she satiated herself all day. To satiate someone is to “make her have enough” of something. 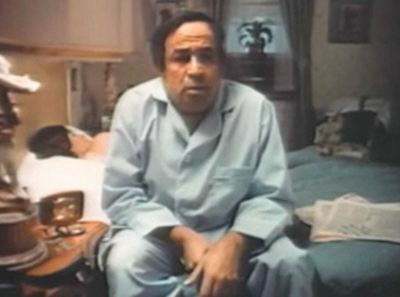 TV Advertisement: Alka Seltzer (1972) He has been satiated to his own discomfort.